In this new installment of Fred Hembeck's hilarious art, we bring the Royal couple from Poseidonis: King Arthur and Queen Mera! Enjoy it. Art by Fred Hembeck, colors by me! En esta nueva entrega del arte de Fred Hembeck, traemos a la pareja Reale desde Poseidonis: El Rey Arturo y la Reina Mera! Disfruten. Arte por Fred Hembeck y colores por mi! Hace aproximadamente un año y medio publicamos la primera muestra de arte por el popular dibujante cómico Fred Hembeck. El año pasado revisitamos a este gran artista con la reinvención de una portada. Desde ese entonces, Hembeck ha creado más arte estelarizando a nuestras pelirrojas favoritas, y que será publicado en este blog. Comenzamos hoy con Batichica y Superchica. Arte por Fred Hembeck y colores por mi! It has been confirmed! After a couple of weeks of speculation, the great Geoff Johns announced at the San Diego ComiCon that Mera will have a protagonic role in Blackest Night... I can't be happier!!! In the world of The Nail, Hawkwoman is one of the eight main characters of the story. She is a senior member of the Justice League of America, and heroine from the planet Thanagar. Years ago, during a fight with the android Amazo, her husband Hawkman was killed trying to help fellow leaguer Green Arrow. Since then, Hawkwoman has tried her hardest to find reasons to stay on Earth. Hawkwoman is introduced in the story watching an interview on TV where Green Arrow, now a deformed and crazy cripple has turned aganist all metahumans. As tensions increase and hate against metahumans intensifies, Hawkwoman has become discouraged, and an enemosity between her and Wonder Woman has started because the amazon is approaching the situation through politics. Hawkwoman has developed a great friendship with Aquaman, who is in many ways as alien to the surface dwellers as she is, and it is he who gives her friendly advice and suggests that perhaps it is time for her to leave Earth and go back to her home planet Thanagar. Shayera resents the fact that after her husband died protecting humanity, it is now that same humanity that rejects her and all super powered beings; and now that Earth has just become the place where she lost everything, she has decided it is time to go. As she prepares to depart, she notices a building on fire and in a last act of heroism, rescues two little children. All the witnesses start thanking Hawkwoman for saving the kids, and when she is about to be arrested by the police, all the people in the nighborhood defend her, and even acknowledge the sacrifice her husband, Hawkman, made in their name. With her faith in humanity restored, Hawkwoman fighs alongside her companions in the JLA against the menace of the Eradicator. Once victorious, she decides to stay on Earth, and with the other leaguers welcomes Superman to the team. ...so it was a kingdom was lost, all for the want of a nail. In the world of The Nail, Mera is the Queen of Atlantis and Aquaman's wife. She is introduced in issue number 2 when she, along with her husband and professor Vulko investigate the sudden dissapearance of all sealife in the Cedros Trench, California. The trio discovers the evil Ocean Master - Mera's brother in law - and his lackey the villainess Marine Marauder. Immediately, the heroes assume that they are responsible for the strange happening; but after a brief fight, they realize the pair was just trying to fight the true menace: an enormous alien ship sent by the then unknown enemy the kryptonian Eradicator. Aquaman asks Mera to attack the ship, which she successfully does with her other-dimensional hard-water powers, and once inside the ship they find all the sealife held prisioner by the enemy. Unfortunately, Aquaman, Mera, Vulko, Ocean Master, and the Marine Marauder are attacked and captured by the Eradicator's forces. Mera's appearance was more of a brief cameo, although she is also seen at the end along all the other super heroes welcoming Superman to their ranks; however, in the small scene we get to appreciate her incredible power levels and beauty. 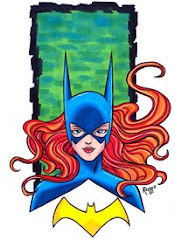 In the world of The Nail, Batgirl is one of Batman's partners, along with a very young Robin. 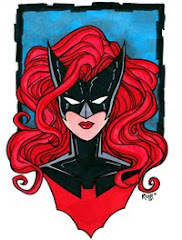 Her personality seems to be in the exact middle of Batman and Robin's; why, while at times she reflects a very serious and to-the-point attitude, she is also bubbly and easygoing. Batgirl is introduced in the story after the Joker takes over Arkham Assylum and involves it in a gigantic forcefield that cannot be penetrated by the police. Batgirl and Robin are the first to arrive, and realize that the the forcefield is designed to recognize their biological signatures and allows them to pass through. The duo then then contacts Batman who is with the Justice League. Batman orders Robin and Batgirl to stay behind while he goes inside the forcefield and into the assylum to investigate, but soon the cape crusader finds himself in trouble because the Joker is in possesion of powerful technology given to him by the Eradicator. The evil villain has trapped the Dark Knight in a forcefield and got him suspended in mid-air, but his luck momentarily changes when the Boy Wonder and the Dominoed Daredoll appear and attack the Joker. Unfortunately for the two young heroes, things turn ugly pretty quickly. The Prince Clown of Crime traps them also in a force field, and to torture Batman he crushes their bodies inside the field. Batman begs the Joker to let them go, but the maniac refuses to listen and while slowly kills Batgirl and Robin, he makes jokes and forces Batman to see. By the time he is finished, both Batgirl and Robin are dead. Even though the deaths are not illustrated, enough images are shown to make it an extremely strong and shocking scene; this is the Joker at his sickest, as far as I can tell; not only has he succeeded in killing two of his enemies, but also did it in such a monstruous manner that he drove Batman insane. During the rest of the story, the Dark Knight is terrorized by the memories of his murdered partners, and it is Catwoman who helps him walk the road back to sanity. 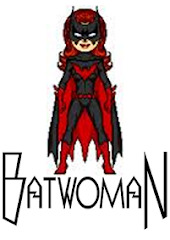 Although hers was a small role in the story, Batgirl made a long lasting impression throughout the series as an important element in Batman's fall and subsequent recovery, and also in the evolution of Catwoman who would eventually become The Batwoman. In 1998 Alan Davis and Mark Farmer brought us an incredible Elseworlds story: The Nail. Set during the most exciting era of the Justice League - the silver age - The Nail tells the story of what the Justice League of America would have been without a Superman. The story starts 24 years ago when Jonathan and Martha Kent were getting ready to drive to Smallville from their farm, but one of the tires in their truck was flat due to a nail. This insignificant event prevented the couple from finding baby Kal-El who was arriving from Krypton. All three of our beloved redheads appear in The Nail, playing their familiar heroic roles, but some of them with interesting and even disturbing twists. The Nail is my favorite Elseworlds story ever because it brought back all those childhood memories and evoked what I think is the best era of the Justice League. 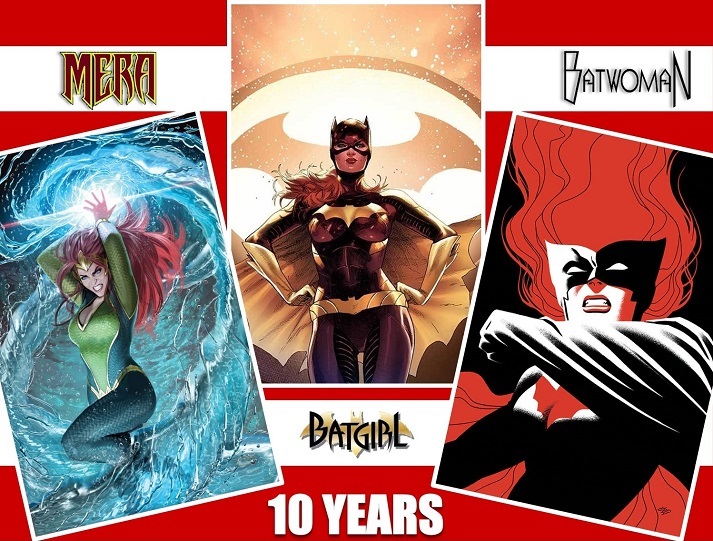 And so it was that 100 posts ago a blog was born as an homage to three of the coolest female characters of the DC Universe. Three powerful, smart, and strong women fight against evil, each in her own particular way. One is a monarch of two worlds, the other is an alien police officer, and the other is a dominoed detective: Chicas de Rojo! Y así fué que hace 100 columnas un blog nació para hacerle homenaje a tres de los mejores personajes del Universo DC. Tres poderosas, inteligentes, y fuertes mujeres luchando contra el mal, cada cual con su propio estilo. Una es monarca de dos mundos, la otra oficial de policía extraterrestre, y la otra detective enmascarada: Chicas de Rojo! Hawkwoman, Mera, and Batgirl in a composite based on the art from "Who's Who". Art by John Workman, Paul Smith, Brent Anderson, and Terry Austin. Composite by me. 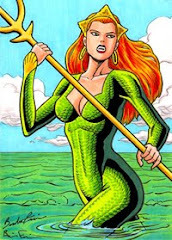 Mera is a native from an undersea civilization of an otherdimensional world. She became its queen upon the death of her father. When the usurper Leron conquered the kingdom, Mera fled through a dimensional warp created a scientist into Earth's Atlantic Ocean. There she first met Aquaman and Aqualad. Aquaman defeated Leron and his accomplices, and Mera regained her throne. Mera was in love with Aquaman, so she abandoned her throne and used the last warp to return to Earth. Mera was later pursued to Earth from her homeworld by Oceanus, who temporarily destroyed her power to control water. When Aquaman became king of Atlantis, law required that he marry an atlantean woman. When Oceanus conquered Poseidonis and captured Aquaman, Mera was responsible for saving them both. Aquaman named Mera an honorary citizen of Atlantis for thwarting Oceanus, and married her. Mera thus became Poseidonis' queen. 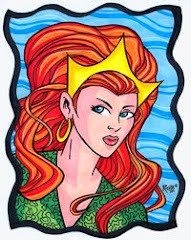 Mera regained her power to control water and had a son, Arthur Jr, who inherited her power. Three years later Arthur Jr died as a result of a battle between Aquaman and Black Manta; over the years, the loss of her son, and the pressures of being married to a part-time rules and full-time super-hero have strained Mera. Mera can psionically cause water to nearly solidify and to form various shapes that she can mentally manipulate. Mera can breathe underwater, but she can also survive without contact with water. She can swim at great speed, and her body is more dense than a normal human's, enabling her to withstand tremendous undersea pressures. 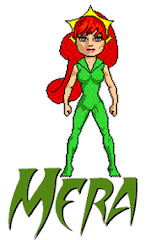 Mera has superhuman strength and can withstand extreme temperature changes. Shayera Thal was born on Thanagar, a planet that has a scientifically advanced civilization and which orbits the star Polaris. As an adolescent, Shayera joined the Thanagarian police force and was assigned to assist the force's most decorated officer, Katar Hol, in capturing the Rainbow Robbers. Hol was at first furious at being assigned an inexperienced young woman as a partner, but was nevertheless strongly attracted to her almost immediately. Together Katar and Shayera captured the Rainbow Robbers in their stronghold, and a few weeks later, Katar proposed to Shayera; she accepted and the two were married. Sometime later, Katar and Shayera journeyed to Earth in pursuit of the criminal Byth. Katar and Shayera remained on Earth battling evil as Hawkman and Hawkgirl. Later, Hawkgirl changed her name to Hawkwoman, and eventually joined the Justice League of America. Hawkwoman can fly at great speed by means of her artificial wings and antigravity belt. The antigravity belt also enables her to lift enormous weights aloft. Hawkwoman utilizes various Thanagarian weapons and has a considerable knowledge of her homeworld's advanced science. She prefers to use duplicates of ancient Earth weapons in battle, which she creates with a Thanagarian duplicator machine. After coming to Earth in pursuit of Byth, Hawkwoman learned all Earth knowledge using a device called Absorbascon. With effort she can retrieve any of it from her subconscious. The device also taught her how to communicate with Earth's birds. Hawkwoman is a superb hand-to-hand combatant. Her body has been treated to withstand extreme temperatures and air friction. She can survive unharmed in the vacuum of space for several minutes. 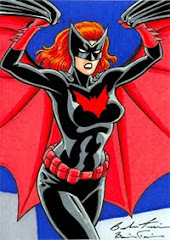 A Ph.D. graduate of Gotham State University, Barbara Gordon began her career as a librarian, while pursued her interest in the martial arts. One evening, on her way to Policemen's Masquerade Ball, wearing a brand new Batgirl costume of her own design, she witnessed Killer Moth ambushing Bruce Wayne as part of a massive extorsion plot. Impulsively rushing to Wayne's recue, Barbara discovered she enjoyed the excitement and danger, and decided to dedicate her life to the fight against crime. Her interest in protecting society led to her serving one term in Washington D.C. as a congresswoman. Defeated in her re-election bid, Barbara now continues her efforts on behalf of the people as Associate Director of Humanities Research and Development. 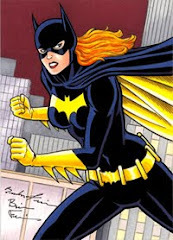 Batgirl wears a utility belt similar to that of the Batman, containing gas and smoke pellets, a batarang, and a bat-line with a grapping hook, among many other variable items. At times she has worn a customized pocketbook on her belt, containing extra crimefighting equipment, but she has discarded it in recent years as being too bulky. She also rides a custom-built batcycle, which contains, among other things, sophisticated tracking equipment. 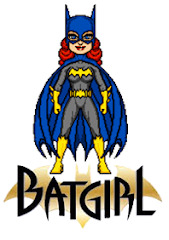 Batgirl is a skilled hand-to-hand combatant, possessing a first kyu brown belt in judo and karate. She has also trained her body to physical perfection, and is an Olympic-level athlete.